. . .His head, neck, and throat were crimson. To be sure, while[Pg 46] the feathers were growing, the colors were not very bright, for the down was mixed with them, and the quills showed so plainly that the young birds looked rather streaked. The sisters were getting their new suits at the same time, and there was just as much reason why they should be vain, but they were not. They were glad (as who would not be?) and they often said to each other: "How pretty you are growing!" They looked exactly like their brother, for it is not with the Woodpeckers as with many other birds,—the sons and daughters are dressed in precisely the same way. 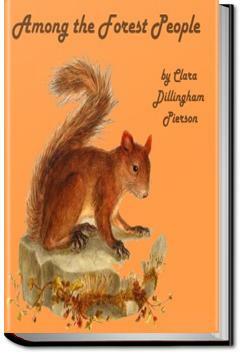 Delightful nature readings for children. This is one of the best books we've read thus far. It is a series of animal stories and each story tells a little bit (or a lot) about the habits and characteristics of a different animal. They all talk so if you don't like talking animals then don't read these.